For the most evenly cooked, tender hard boiled eggs, forget the boiling water, use a steamer instead. Why this recipe works: Placing eggs into a pot full of steaming water cooks them evenly and gently with less risk of cracking than dropping them into simmering water. Chilling the eggs immediately after boiling ensures that they come out perfectly shaped with no air space indentation on their fat end. Starting the eggs hot and peeling under running water makes for easy, divot-free peeling almost every time. Perhaps the most common problem with hard-boiled eggs is overcooking. That's what happens when the yolks are pale yellow with that familiar green band around the outside. There is frequently the odor of sulfur. This is due to a reaction between traces of iron in the yolk and sulfur in the white. It happens only when eggs have been overcooked. Perfectly cooked yolks are moist and deep orange. Needless to say, there is no chemical smell. The second biggest problem is cracked shells that leak yolk and white out into the cooking water. This is caused by too-rapid heating. All eggs contain an air pocket at the base (the wide, rather than the pointed, end). When the air pocket is heated, it expands. If it is heated too quickly, it more like explodes, cracking the shell. 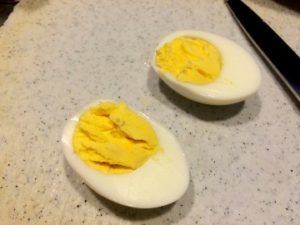 So what is the best way to get a hard-boiled egg? The answer: Steaming! Why steamed eggs are easier to peel. Egg shells are permeable, which means that they are porous. The water molecules that the steam form are small enough to penetrate the shell. While the don't disrupt the membrane, the heat from the steam is adequate enough to cook the egg inside. Start with cracking the large end of the egg and peeling off the cracked shell. This will expose the air bubble that forms naturally on that end of the egg.